For those of you who have returned to Beaver Creek for our beautiful summer season, welcome home. For those of you who are missing our wonderful summer, we wish you were here. Through our quarterly newsletters, we hope to provide all of our members with newsabout events in Beaver Creek over the next few months and to update you on important topics effecting all of us in the community. Here are a few newsworthy morsels from the neighborhood. Escape to Beaver Creek in the height of summer for our renowned Independence Day celebration! For all of its big, celebratory fun, our 4th of July celebration maintains the thoughtful touches and friendly intimacy that make Beaver Creek an unparalleled destination. Our alpine village provides a beautiful and contained setting perfectly suited to this family friendly event, which includes live music, complimentary kids’ activities, incredible food and endless opportunities for mountain adventure. The day culminates in a performance by country music star Walker Hayes and an evening fireworks display that lights up the Rocky Mountains. Purchase a VIP pass for access to a private basecamp in the center of the action. The Vail Valley’s best kept secret, Concerts by the Creek is Beaver Creek’s Wednesday evening free live music series. Enjoy the music as the sun sets on the mountains from Creekside Park. Music starts at 5:30pm and snacks and drinks are available for purchase, so all you need to bring is a blanket and some friends! Make it a complete Beaver Creek evening, with complementary ice skating for all concert-goers and a village of shops and restaurants. In the Kitchen with Splendido: NEW! Friday, June 22 11:30 a.m. – 1:30 p.m. In the Kitchen with Toscanini: New! July 13 11:30 a.m. – 1:30 p.m.
Zusammen: Communal. Marketplace. Dining. : New! Zusammen is German for Together. As the sun sets over Beaver Creek, enjoy an open-air shared dining experience and live music in the Village. Complimentary admission, with food and drink available for purchase. Dial-a-Ride gets a new name and new state of the art technology to improve and enhance service…. Dial-a-Ride will become Village Connect. Summertime / Fall hours: 7 days a week 7:00am-Midnight For a convenient ride anywhere within Beaver Creek or Bachelor Gulch, call 970-949-1938 to arrange a pick up. New Technology Upgrades: a new transportation booking platform is coming soon which will enable the community to book all its resort transportation on an APP based platform replacing the historical procedure of calling dispatch to arrange a vehicle. In addition, the new APP will enable the community to view on a map the current location of the Village Connect vehicle coming to pick you up with live estimated times of arrival. No longer will you need to peek out your window to see if the bus has arrived to pick you up! However, if an owner still desires to call in to make a reservation, the option to call in to dispatch will continue to be available. A follow up communication will be sent to the community from BCPOA once the new APP is available, estimated to be in early September. This free communication tool provided by Eagle County will enable you to get up to the minute communication on any weather, road, traffic, and emergency conditions you wish to receive through text on your cell phone, in an email, or both. The great thing about this service is you customize it to your choice of options. Our neighbors who have subscribed have very positive things to say about it. Try it, you will like it. Everything distributed through reverse 911 also gets sent out to EC Alert recipients. This redundancy is an important feature. It also ensures residents will receive updates even when they are not in Beaver Creek. Beaver Creek Public Safety can be a second line of defense for the protection of your property but for them to be effective and efficient property owners need to contact Public Safety at 970 949 4911 and provide them with updated information on property ownership, caretaker contact information, owner’s home and mobile phone numbers so they can contact the correct individuals if and when something happens to your property. Did you also know that Beaver Creek Public Safety can be added as a contact with your alarm monitoring company? That is a good idea as they may be in the closest proximity to your property when problems arise. Call your monitoring company today. The Bears are back in town…. 1. Never feed a bear. 2. Trash management – Use only bear resistant trash containers and store them indoors between pick-ups. Put trash out the morning of pick up and bring in empty trash receptacles the same day. Empty receptacles will also attract bears. 3. 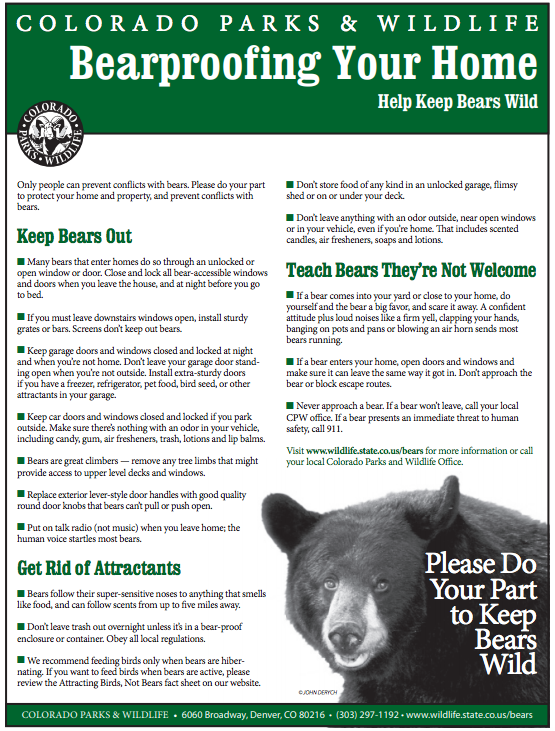 Do not feed birds at all when bears are active (March-November). This includes seeds and hummingbird feeders. 4. Lock all lower level doors and windows, including sliding doors and pet doors. Upper level doors and window should also be secured if they are accessible via tree limbs or a deck. 5. BBQ grills will attract bears even when not in use. They should be stored indoors or cleaned of all food residue and grease following each use. 6. Do not feed pets outdoors. 7. Remove fruit bearing trees and bushes from property. If you have fruit bearing trees, the fruit should be removed ASAP. 8. During winter months, when bears are in hibernation, it is important to maintain all of these practices as they will still attract other wildlife like raccoons and fox, which will in turn attract mountain lions. If you choose to use bird feeders while bears are hibernating, pick up the spilled or excess seed frequently as it will attract these small mammals. 9. Please report all bear activity to Beaver Creek Public Safety (970-754-4911). They will respond, document the encounter, and contact the Colorado Division of Parks and Wildlife if necessary. 10. Help all of Beaver Creek by sharing this information with your neighbors. Summer Fire Danger is high due to limited winter snow pack and limited spring rains. 1. Building, maintaining, attending, or using a fire, campfire, or stove fire. 36 CFR 261.52 (a) This includes charcoal barbecues and grills EXCEPT: Building, maintaining, attending or using a fire in constructed, permanent fire pits or fire grates within developed recreation sites and the use of portable stoves, lanterns using gas, jellied petroleum, pressurized liquid fuel or a fully enclosed (sheepherder type) stove with a 1⁄4” spark arrester type screen is permitted. 2. Smoking, except in an enclosed vehicle or building, a developed recreation site, or while stopped in an area at least three feet in diameter that is barren or cleared of all flammable material. 36 CFR 261(b). 3. Operating a chainsaw without a USDA or SAE approved spark arrester properly installed and in effective working order, a chemical pressurized fire extinguisher kept with the operator, and one round point shovel with an overall length of at least 35 inches readily available for use. 36 CFR 261.52(h). There has been a longstanding Evacuation Plan for the Beaver Creek community which has always been interfaced with Eagle County, the state of Colorado, and our federal government. Recently Jim Clancy, Director of Public Safety has updated and condensed Beaver Creek’s Evacuation Plan and it is in place to handle any potential evacuation of our community. The plan is a fluid plan that supports evacuation for any number of reasons and has the support of multiple government agencies to react for the greatest impact to those effected.